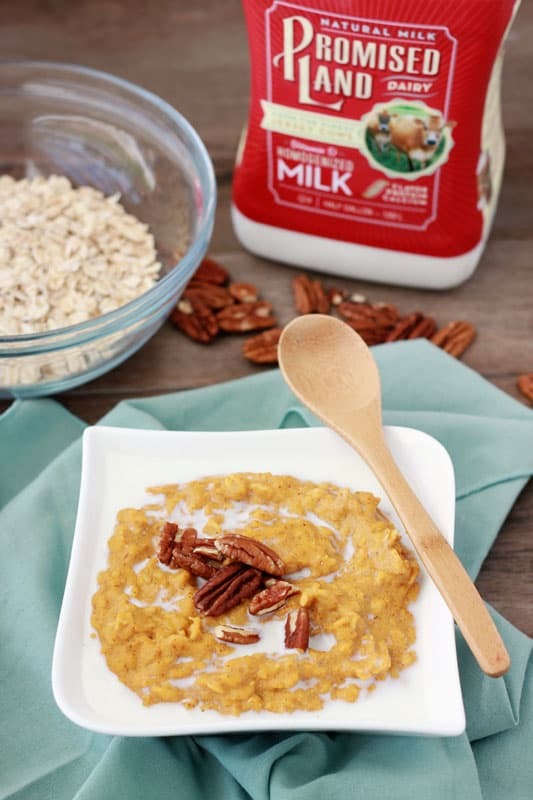 Pumpkin Pie Oatmeal. Fall flavors blend with pumpkin puree, oats, whole milk, pumpkin pie spice, and brown sugar- giving you the perfect breakfast recipe! My seven year old is always hungry so making sure he has a filling breakfast in his belly before he heads off to school is high on my priority list. 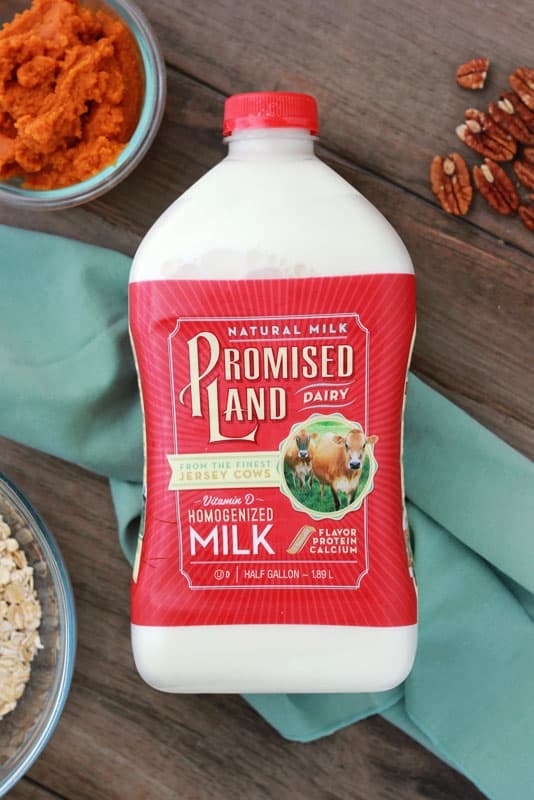 The recipe starts with Promised Land Milk (hooray for protein and calcium!) 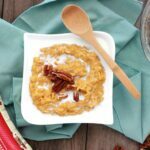 and is topped with toasted pecans for the perfect breakfast that is great for every day or special occasions! Is it kid approved? You bet. He devoured an entire bowl and immediately asked for seconds. I consider that a parenting win! 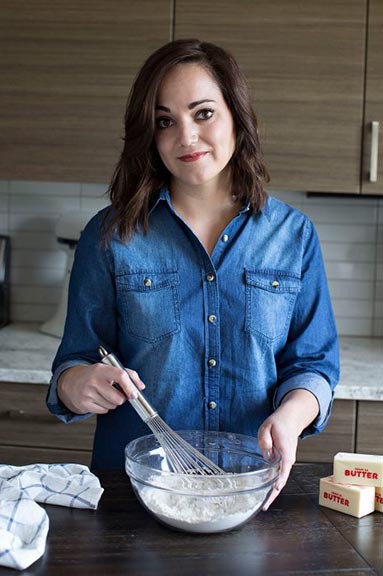 How easy is the recipe? The great thing about this breakfast is that it takes only 20 minutes to prepare. We make it the day before and pop it straight into the microwave to make our morning even easier. Just combine all of the ingredients, cook, and serve with a dash of milk right on top! Your entire home will almost instantly fill with the smell of warm pumpkin pie which will bring the entire family to the table excited to dive in! Like this recipe? You will love my Coconut Spice Oatmeal, Cinnamon Baked Oatmeal, and Cinnamon Brown Sugar Oatmeal Bars! Combine the pumpkin puree with the milk, water, brown sugar, and pumpkin pie spice in a medium sauce pan and bring to a boil. Stir in the oats and simmer for 10 minutes or until soft. 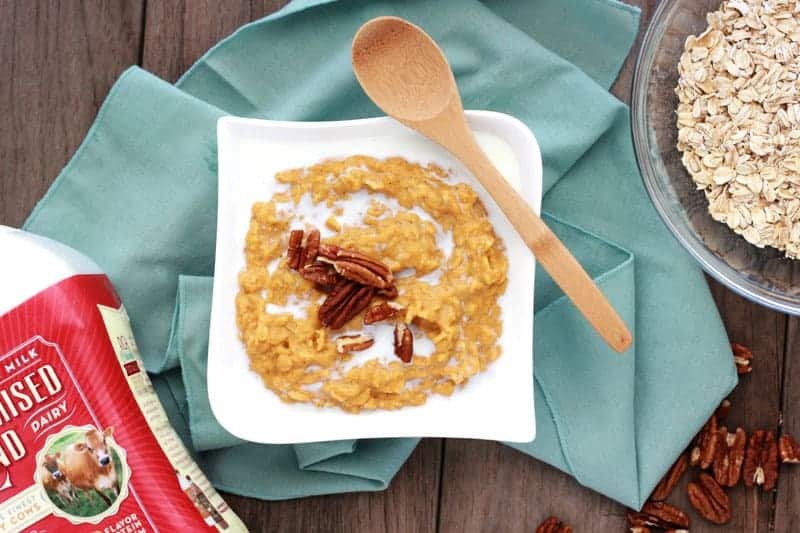 Serve topped with additional milk, toasted pecans, and maple syrup. Make sure you use pure pumpkin and not pumpkin pie filling. Substitute additional brown sugar for the maple syrup.